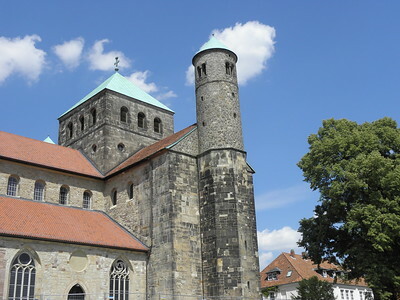 St. Mary's Cathedral and St. Michael's Church at Hildesheim are two inseparable monuments that are an exceptional testimony to the religious art of the Holy Roman Empire. St. Mary's Cathedral was built between 1010 and 1020 in Romanesque style. 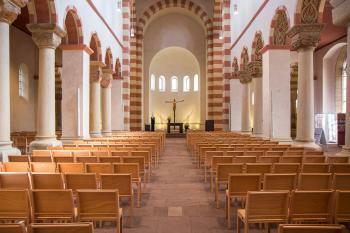 It follows a symmetrical plan with two apses, that is characteristic of Ottonic Romanesque architecture in Old Saxony. The cathedral is famous for its many works of art. These include: the bronze doors, commissioned by Bishop Bernward (1015) and with reliefs from the history of Adam and of Jesus Christ, and a bronze column 15 ft. high (dating from 1020) adorned with reliefs from the life of Christ. 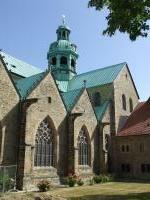 The Church of St. Michael also is an early-Romanesque church. It was founded ca. 1010 by Bishop Bernward. 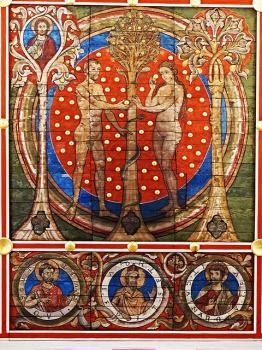 The church has a famous painted ceiling, with 1300 pieces of wood, and was the original location of the bronze Bernward doors (now in the Cathedral). My first visit in 2006 I should probably count as a half-visit: I did go and see both churches, but wasn't able to admire the art which has earned them their recognition as WHS. The Dom (St. Mary's Cathedral) was closed because of Mass, and the St. Michael's was undergoing restorations. Viewed from the outside, both churches are very much alike. St. Michael's setting is a bit more impressive, on a hill just outside the city center. In July 2011, while on my way back from the nearby Fagus Factory, I decided to stop in Hildesheim again. They still are very busy restoring these 2 Christian monuments: the Cathedral now is closed (until 2014 or 2015), and the St. Michael's Church is partly hidden under scaffolding. Fortunately, they have finished working on the interior. The church is open to the public again. As Ian Cade has stated below, it looks almost too clean and fresh to be true. There's not much decoration inside, no miracle since this is a protestant church nowadays. But it holds some major works of art: the elaborate and colourful wooden ceiling, and two 11th century bronze objects "on loan" from the Cathedral: its very fine baptismal font and the Easter column. Just realizing how very old these objects are, their state of preservation is amazing. Both buildings are easy walking distance to each other. In fact, most of central Hildesheim is easy to navigate by foot. The church and the cathedral are open to visitors during normal hours and when there are no religious services taking place. Although the architecture of both sites is interesting make sure you also take time to appreciate the artworks. The ceiling painting in the church and the bronze doors and column in the cathedral are the highlights but there’s much more to see as well. 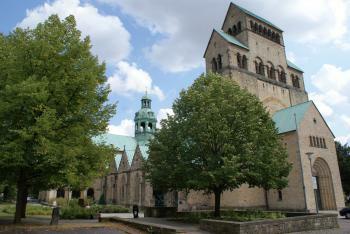 There are a number of other sites to visit in Hildesheim while you’re there. The historic market place is worth checking out and you might also consider the Roemer-und-Pelizaeus Museum which has a collection of ancient Egyptian and Peruvian exhibits. I visited this WHS in November 2014. After visiting the Market Square I headed straight to St Mary's Cathedral. It's neatly hidden behind tall buildings and nothing too special from outside. The interior is completely restored and apart from some golden relics and a shrine there's really nothing left to see. The main highlights are the bronze doors, baptistry and pillar which were on loan for some time at the St Michael's Church. I would never even classify such a church as a world heritage site and in my opinion it wouldn't even classify as a top national heritage. Next, I visited St Michael's church and although I preferred the exterior from that of the Dom, still I wasn't impressed and I really thought that this must be one of Germany's least interesting WHS ... then I went inside the church and was awestruck upon seeing the old colourful wooden ceiling. It's almost too good to be true. It's truly world class and deserves to be on the WH list on its own. The fact that it's free to visit is incredible at this day and age (especially after a recent visit to the Naumburg Cathedral which costs from 6 to 8.50e and isn't a WHS yet!!!). If you have enough time, I'd recommend a visit to the Roemer-Pelizaeus Museum which is mostly dedicated to Ancient Egyptian and Ancient Peruvian art including the second largest collection of Chinese porcelain in Europe. As Hildesheim was destroyed by bombing in late March 1945 the town generally still suffers from that. At the world heritage site, there are big reconstruction works going on(2012) and is not tourist friendly. Planned to end 2015, so i recommend to wait until 2016 for a visit. Don't miss to walk the "Kulturweg auf den Rosenroute" which leads you through the rest of what is interesting in Hildesheim. 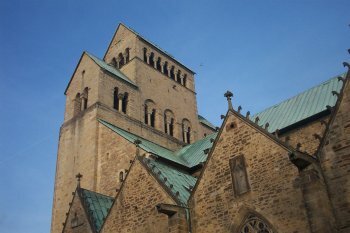 As I visited Hildesheim in September 2009, the Cathedral of St. Mary's was still open (now closed for renovation until 2014) and at St. Michael the renovation of the interior was already completed, only one outer wall was partly under scaffolding. Both churches are the best examples of early-Romanesque architecture and interior design. The typical elements are visible: thick, fortress-like walls, massive towers, and the typical round arches. In particular St. Michael beautifully illustrates the geometric principles of Romanesque style. In the Second World War both churches were almost completely destroyed and rebuilt in the 1950s. The Baroque ornaments were omitted, and the churches were rebuilt in their presumed original Romanesque style. A significant part of the WHS is the art treasure from the 11th century: the two-winged bronze door (with depictions of the history of salvation), the Christ column (depicting scenes of Jesus' life), the Hezilo-Candelabrium. As other reviewers, I was impressed by the colourful wooden ceiling in St. Michael. Its effect is even enhanced by the sparse decoration of the interior. I like to visit medieval cathedrals and monasteries, I like the mood and the atmosphere there. But there are a lot of them on the WH list and sometimes it is hard to understand why a certain cathedral is a World Heritage site and another one is not. The special features in Hildesheim are the pure Romanesque style and the extraordinary art treasures. A visit is worthwhile if you are in the area. The city is easily accessible, it is close to major highways and railway lines. 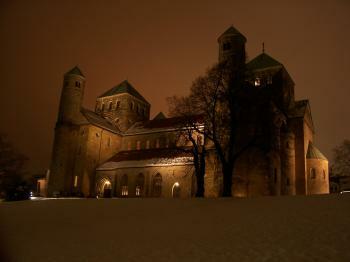 It felt like everything was conspiring against me when I visited Hildesheim on New Year's Eve 2010. Mistakes with trains meant I managed to turn up at the closed Cathedral well after it had got dark, and I was greeted with a few temporary cabins and ply wood covering the hole where the famous bronze doors would normally stand. I should have realised just how extensive the ongoing restoration would be. Feeling a little down that I wasn't able to see too much of the site I headed back towards St Michael's church to have a look on the way to the station. I was instantly more impressed with the location being on a small hill, it really sat up from the surrounding buildings. As I walked up the congregation started coming out from inside and looked up towards the bell tower. Then a Brass band proceeded to play for the next 10 minutes whilst we all stood and admired, it really revived my spirits and was a really great experience. The vicar then spoke to me and realising I was a tourist asked me if I wanted a quick view of the interior, I of course said yes. I was not really prepared for how impressive it would be. The painted ceiling was magnificent, but I didn't want to overstay my welcome so just had a quick glimpse, the interior felt almost new, perhaps a little 'too restored' for my initial liking but the ceiling was the main focus of my attention. Listening to the brass band whilst standing with the congregation on the snowy hill was a brilliant experience and one that reminded me that it is these chance happening that make travelling so rewarding. I happily plodded back off to the station, dodging the fireworks, staring longingly (and warily) at the small arsenal that every German seemed to be clutching in preparation for the evening's festivities. I think I would be happy to revisit to see the cathedral after restoration and hopefully catch sight of the famous bronze doors. Externally these two monumental buildings have architectual merit, and the restoration of St Michael's church has been completed. The interior of that building is pristine, and is now restored to its original condition. The Dom on the other hand is now undergoing restoration and will be closed until 2014. So I was only able to access the cloister and its garden. But I did see the bronze doors. Moved from location of original construction: The monumental bronze-cast Bernward's Column, with 28 scenes taken from Christ's life is moving from the Hildesheim cathedral to St. Michael�s church. Therewith the column returns to its first location bareley after 1000 years. 174 Community Members have visited.